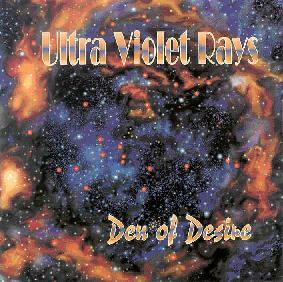 Ultra Violet Rays - "Den Of Desire"
Fans of neo-prog bands like IQ, Pendragon, Twelfth Night, Grey Lady Down, and Marillion step right this way. Ultra Violet Rays serve up heaping portions of tightly played progressive rock that is highly accessible yet has just enough structural and thematic complexity to give the thoughtful listener plenty to digest. The band consists of Mike Bukovac on bass, Anthony Taddeo on drums, Bill Spear on guitars, Steve Hayes on keyboards and guitars, and Johnny Frey McMahan on vocals. Aural Innovations readers will know Steve Hayes as a member of the recent Star Nation project with Richard Chadwick and Jerry Richards. The opening track, "Another Day In Paradise", is one of my favorites featuring gorgeous guitar and piano melodies, and across its 7-minute length the song transitions through a number of themes that keep things continually evolving and interesting. And I dig the trippy space synths at the beginning. "Fever In Her" reminds me of Grey Lady Down circa The Crime album. The combination of crunchy rhythm guitar and soaring lead lines is a highlight that gives a grandiose feel to the music. "Velvet Wetlands" is a powerhouse tune with some cool funky wah guitar licks. And "Beaches" is another one of my favorites being a heavier rocker but with majestic sections that remind me of classic IQ. Really nice keyboard lines. A great combination of crunchy rock and beautiful melodies. The rest of the album is more of the same, all solid songs that grabbed me from the first listen. I like McMahan's vocals which are powerful and expressive in a way that reminds me of Peter Nicholls and the late great Geoff Mann. Fans of the 80s British neo bands will most certainly like Ultra Violet Rays' well written and arranged songs. For more information you can email Salad Farm Records at haystack@alltel.net. Contact via snail mail c/o John McMahan; 6419 State Route 166; Rock Creek, OH 44084.